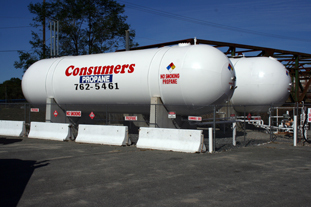 Consumers Propane delivers propane gas to Northern Rhode Island and Southeastern Massachusetts customers at a competitive price. Our fleet of propane delivery trucks and our bulk storage facility provide an ample supply of propane gas to your home or business for all of your propane needs. We have highly trained and qualified propane gas technicians and offer emergency heating service twenty four hours a day, seven days a week. Propane can be stored in various sizes of steel tanks that can be installed above ground or below ground. The size of the steel tank will depend upon your propane appliance requirements. Did you know that propane burns cleaner than many other fuels? Did you know that appliances powered by propane use less energy and save you money? Did you know that besides being one of the most efficient fuels, it is one of the cleanest? Please contact us for any of your propane needs. Our friendly and knowledgeable customer service representatives will set up an appointment so you can discuss the propane options available to you. © 2011 Consumers Propane & Bousquet Oil. All Rights Reserved.